Unai Emery is a very interesting appointment for Arsenal and the former Paris St-Germain boss deserves a chance. The Spaniard is a coach who will improve players. He does not need superstars that cost £100m to do his job. He is very highly rated by clubs across Europe - that's why PSG chose him to replace Laurent Blanc two years ago. Although they did not renew his contract, which expired at the end of the season, Emery did some very good things at PSG. It was a big leap from his previous job at Sevilla with all the expectation in Paris and the main objective being to win the Champions League. But there is a rebuilding job to do at Arsenal and it may well suit Emery far better than the PSG job did. Of course, Emery was the man in charge when PSG were beaten 6-1 by Barcelona at the Nou Camp last year to lose that remarkable Champions League last-16 tie. But he was also in charge when they beat them 4-0 in the first leg in Paris. That was an incredible game, it was a tactical masterpiece by Emery, the way his team pressed high and the intensity they had. The second leg was very disappointing but the players have admitted they played with fear, which was not Emery's plan. The reaction might be more positive if Arsenal had recruited him from Sevilla instead of PSG. In Paris, he went to a club with big egos and, in certain aspects, he did not manage to deliver, so I can see the reservations some Arsenal fans might have. He did struggle to manage the big names, especially Neymar, this season. Earlier this month Emery said Neymar is the boss at PSG, it was not him and he knew that. It was Neymar's team and Emery never managed to manage Neymar. But Mesut Ozil is not Neymar. There is no-one in that Arsenal dressing room as egocentric as the Brazil forward. And Arsenal is a different situation and with a different ownership. Emery won't have the same pressure he had at PSG and the context at Arsenal maybe suits him better - he arrived in Paris after winning three straight Europa League titles and people thought PSG were then going to win the Champions League. At Sevilla it was more of a family environment. Emery is a good man-manager and great tactically. He's got a lot of things going for him. Neymar was the one thing he couldn't manage. His first game at PSG was the 2016 Trophee des Champions - the French Community Shield - against Lyon and they won 4-1. PSG played with an intensity like they never had before. It looked like his philosophy - pressing high, running a lot, attacking a lot, defending a lot, full backs bombing forward. At Sevilla, Emery and then-director of football Monchi did an amazing job. The best job Emery did at Sevilla was to take those players Monchi was finding in the lower leagues in France or obscure leagues across Europe, improve them, make them play as a team and win trophies. If you realise there is a rebuilding job to do, you need someone who will work on the training pitch to improve the players you have because there might not be much money to buy another 10 to 15 players. Emery is the right guy for that. He will work well with head of recruitment Sven Mislintat and a young player like defender Konstantinos Mavropanos will blossom under Emery. Meanwhile, it looks like former Arsenal midfielder Patrick Vieira is going to Nice to replace Lucien Favre, who is taking over at Borussia Dortmund. That's the perfect platform for Vieira to one day get the Arsenal job. Brighton defender Bruno played under Emery for two seasons at Spanish side Almeria and for another three years at Valencia. 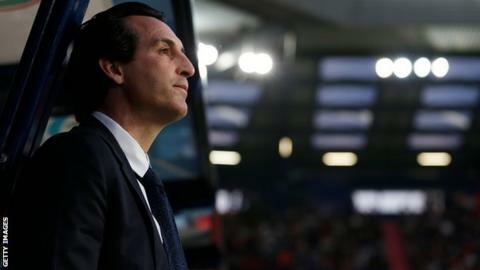 He told BBC Sport Emery will introduce a "big change" of mentality at Arsenal. "He is a really good manager", the Spaniard said. "He is a really hard worker. He loves to analyse every single team - it is one of best strengths. "Arsenal will be a big challenge but I think he is ready to take this challenge." Bruno also said Emery would be used to dealing with players with "big egos" from his time at PSG and added that the Spaniard's style of play "fits perfectly with the philosophy of Arsenal". "When you see someone with that passion, not scared about working, plus his talent, it is a perfect combination to be successful," Bruno said.